1) Regarding the audio in the AAF, unless you have "Discard disable clips" "Reference multi-channel WAV files" and "Generate a warning and continue creating an AAF file" enabled in the X2Pro preferences, it is possible to create an AAF without all of the media. However, in the .txt file created with the AAF it will list any clips which are not in the AAF. 2) X2Pro can convert retimed compound clips, but only in 1.6 fcpxmls. In projects exported as older fcpxmls, compound clips cannot be retimed because X2Pro is unable to convert them. James - The xml was never edited manually. All clips were replaced in the timeline in FCPX and a new XML was generated. Update - After removing all 48khz audio issues I was able to get around the last error (Calculating Boxing...) I sent you by reimporting the new xml back into FCPX (into a new library) and re-exporting a new xml. Then, X2Pro was happy. 1) I was able to produce an AAF file for the project which was about 3.4GB in size. Does this AAF contain all the audio media or do I also need to send to post-audio a copy of the original raw media from FCPX? 2) My "Project" timeline (from which I exported the xml) contains four "compound clips" that make up Acts 1, 2 , 3 and 4. - Will an export of an xml from this project give my post-audio what they need to do a mix or do I need to have the inner workings of the compound clips all on one project timeline --- un-compounded? I am not sure how x2pro will handle the compound clips. Thanks for helping us through this process. Last Edit: 1 year 6 months ago by Sanders. How did you remove the clips ? If they were deleted out of the XML manually then this explains why the FCPXML is corrupt. They would need to be replaced in the timeline in FCPX and a new XML generated. If I try to import that XML back into FCPX it crashes FCPX, I am using OS 10.13 and FCPX 10.3.9, can you import this XML back into your FCP ? James - Thinking through the process you outlined -- I went through the xml and found all instances of the 48009. ... and replaced the movies using compressor and relinking. I produced a new xml and the audio rate error is gone however we now have a new one - see below. I am starting to have concerns about getting this to work? Anyway we can take this to a another level of support? Trying to get retiming with 0 duration. There are two clips with a sample rate of 48009.2, can you do the honours with the following two clips as well please. asset id="r578" name="Viggo Wild Horse 2" uid="2887DF10FD2C40323600359651BD4971" src="file:///Volumes/MyBigNewRaid/FCPX%20FILES%20Kleinert/Raw%20Media/Final%20Cut%20Original%20Media/2005-01-14/Viggo%20Wild%20Horse%202.mov"
asset id="r573" name="Dan Flores History of H tk 1 1-12" uid="2079944E354704E222A97FCD37AA253E" src="file:///Volumes/MyBigNewRaid/FCPX%20FILES%20Kleinert/Raw%20Media/Final%20Cut%20Original%20Media/2015-05-30/Dan%20Flores%20History%20of%20H%20tk%201%201-12.mov"
Hi James - First off thank you for your help - We are trying to get to audio post out for two festivals screenings so we are feeling the heat. I ran the five clips "David O RoundupVideo" through COMPRESSOR and replaced them in the timeline. I also ran a test to see if compressor would solve the problem --- by creating a new timeline and dropping the old and new clip into the timeline and then exporting and testing the xmls in X2Pro. Compressor was fixing the the problem. xmls with the new clip were readable by x2pro. If you look at the error message we see some media marked in the XML as having 48000.8 hz sample rate. We can accept any whole number but .8 is not something we can cope with (I am surprised FCPX can). There are references to five pieces of assets that have this rate assigned, you might be able to push these clips through compressor or some such to create new clips that have a sample rate of 48000, and add these back into the sequence. asset id="r39" name="David O RoundupVideo-7" uid="7843B7CC23E912690EAB4F016323B1D2" src="file:///Volumes/MyBigNewRaid/FCPX%20FILES%20Kleinert/Raw%20Media/Final%20Cut%20Original%20Media/2015-05-30/David%20O%20RoundupVideo-7.mov"
asset id="r45" name="David O RoundupVideo" uid="A2D4211C13BF76B55F06DDEC03684ADB" src="file:///Volumes/MyBigNewRaid/FCPX%20FILES%20Kleinert/Raw%20Media/Final%20Cut%20Original%20Media/2008-10-06/David%20O%20RoundupVideo.mov"
sset id="r308" name="David O RoundupVideo-10" uid="A5F5AC277AD1A7A58C4DCF13B9BD2C77" src="file:///Volumes/MyBigNewRaid/FCPX%20FILES%20Kleinert/Raw%20Media/Final%20Cut%20Original%20Media/2015-05-30/David%20O%20RoundupVideo-10.mov"
asset id="r308" name="David O RoundupVideo-10" uid="A5F5AC277AD1A7A58C4DCF13B9BD2C77" src="file:///Volumes/MyBigNewRaid/FCPX%20FILES%20Kleinert/Raw%20Media/Final%20Cut%20Original%20Media/2015-05-30/David%20O%20RoundupVideo-10.mov"
asset id="r1165" name="David O RoundupVideo-2" uid="72E9B8536C60F588ACBC62E7307576EB" src="file:///Volumes/MyBigNewRaid/FCPX%20FILES%20Kleinert/Raw%20Media/Final%20Cut%20Original%20Media/2015-05-30/David%20O%20RoundupVideo-2.mov"
May we ask how the media in question was created ? Hi James, I was able to go through the entire show (two-hours) and export (Master/ProRes files) and replace them - all shots with "Tweetie Int. ...". I then tried to open a new XML file and got the same error message - below. Thank you for your attention to this matter! We'll work to remove the clip and try to export again. The issue is in line 1580 on the XML, if you try to re-import this back into FCPX you will get an error. As such the XML itself is corrupt. Line 1580 refers to an instance of a clip called "Tweetie Int. 1-1.mov", if possible you might want to remove this clip from your timeline, see if it can be exported (and then imported back in FCPX) if it can then you might want to try to add this clip again and see whether FCPX will be happy and create a valid XML a second time. I just purchased- I am trying to move audio to post and my xml file is producing the following error: Unable to parse FCP XML file to obtain project information. Any help and direction would be greatly appreciated. I moved your post to a new topic as it was a different cause than the previous topic error. 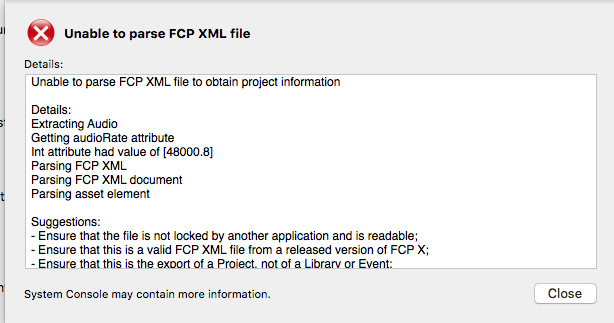 You FCPXML appears to be of the FCP Library and not the actual Project that you are wanting to create the AAF for. If you can be sure to highlight the Project file before clicking on the File--> Export XML button, that should get you past this problem you are seeing. Give that a go and let us know how you get along.